I am no great fan of the Modernist school of architecture which decreed that “form follows function,” but I will agree that this principle should apply to Kindle e-book samples. And let’s be clear: the function of the sample is to convince the reader to read the whole book. Therefore, everything included in the sample should somehow contribute to that end. The first thing included in a Kindle sample (although, oddly, not the first thing you see when you open the sample) is the book’s cover, followed by the title page and “front matter.” In fact, however, the sample usually opens at some point after the front matter, so frequently readers never look at the cover in their sample – they’ve probably already seen it on Amazon’s web site. An attractive cover often is the first thing that draws a reader to a book. But in a Kindle sample, readers may never see the cover unless they are viewing their library on a Kindle Fire, which (I believe – correct me if I’m wrong) displays color thumbnails of the book cover in the library view. I’ve got an old-fashioned Kindle keyboard, so I never see the cover unless I deliberately select “Go To| Cover” from the device’s menu. Of course, I did that for this review and, when I did, I got a surprise: the cover shown on the Amazon site does not appear in this sample. Instead, I get what is essentially a title page with a grey border around it – just the title, author’s name, and publisher logo. But it’s not the title page, it’s the “cover” page. If I go to the next page of the sample, I get a page containing only the words “Old Man’s War.” But that’s not the title page either, because if I go to the next page I find the title, author’s name, and another version of the publisher’s logo. So, basically, there are three title pages in a row, rather than a cover & title page. This may be a holdover from print publishing – I’m guessing the second page, with just the book’s title, is a kind of electronic “flyleaf.” But in an e-book it’s just bad form – there is no reason for this useless repetition, and we’ve now wasted three pages of the sample on what could have been conveyed on one. So far, I am not impressed. Before I go on, let me just say a few words about book covers. The ideal book cover should suggest two things: the content of the book (in the case of a novel, the kind of story being told) and the flavor of the book. For works of fiction, this is a tricky consideration, and for science fiction novels that take place largely in outer space, even dicier. Far too many scifi novels, in my opinion, rely on artwork (either original artwork or digitally manipulated photographs) that depicts the depths of space (starfield) superimposed with space craft and/or a large stellar or planetary body. BORING. After you’ve seen a few, they all look alike. And, of course, for a Kindle thumbnail, it’s even harder to make the cover eye-catching or memorable. As I’ve already noted, this Kindle sample doesn’t even bother to reproduce the cover art and, in particular this case, that’s no great loss. As you can see from the color thumbnail I’ve posted here, the cover of this book is pretty generic: deep space punctuated by a planet, with spacecraft diving toward the planet. The only thing that stands out is the typography of the title and author. Completely lost in the thumbnail (and therefore, in my opinion, entirely extraneous) is the micro-type of the a too-long blurb of praise from Publisher’s Weekly. So I’m not exactly boohooing that the Kindle sample doesn’t bother to include this busy image (which would look rather bland in the black & white of my Kindle 3). Still, why not include it (or a simpler version of it), instead of the boring title-page-with border that stands in for the original artwork? Once I have waded through all the title pages, I get to the copyright page, which also includes a notice that even though the book is provided free of DRM (Digital Rights Management) software, nonetheless you must not make copies for your friends or strangers. This information – which essentially means “Even though we’ve made it easier for you to pirate this book, it still would be illicit for you to do so” – is important in a published book, but not in a free sample, which no one is ever going to pirate. (I’m dubious that this language actually dissuades anyone from making illegal copies, anyway.) It could have been moved to the end of the e-book so that it wouldn’t take up yet another precious page of the sample. Actually, this wouldn’t have bothered me if it weren’t for the fact that there were three friggin’ title pages! By the time I’ve gotten to the copyright page, I’m at the four percent mark in the sample. And then I get to the dedication page – another page that could have been moved to the end of the book. “Regan Avery, first reader extraordinaire,” as well as “Kristine and Athena” probably never would have noticed, or cared, that their mention got shoved to the end of the e-book, as I imagine (and hope) that Scalzi gave them each a personally inscribed print version. Anyway, I could have done without it. We’re now at 6% of the sample. But the book is about to begin! I can hardly wait! But wait I must, because the next page is the table of contents. Now, as I said in my earlier post, including the table of contents in the sample can be very helpful if it somehow serves to give the reader a feel for the book as a whole (which is, after all, the whole point of the sample). This is truest of non-fiction books, however, because most works of fiction do not provide chapter or section titles. And, alas, that is the case with this novel: we get “Part I, Chapter One, Chapter Two, etc.” Useless. Even more useless when you consider that the hyperlinks in TOCs of Kindle samples link to chapters that aren’t there – when you click on them, they just take you to the end of the sample. A short trip in this case, because we’re already at 14% of the sample and have not yet read a single word of John Scalzi’s Old Man’s War. I hurriedly push the “next page” button and see – a nearly blank page, containing only the unhelpful words “Part I.” (By the way, this is the page to which the sample originally opened, and the page to which the reader will be taken when selecting “Go To | Beginning” from the Kindle menu.) The good news is that on the following page (23% mark), we finally get to read words John Scalzi has written. Now, I assure you that in future Kindle sample reviews I will not plod this slowly through the formal considerations, but I hope you publishers and self-publishers get my point: e-books need to be organized differently than print books, particularly when a free sample is serving as the electronic equivalent of a reader browsing a book in a bookstore (cover art, blurbs, etc.). 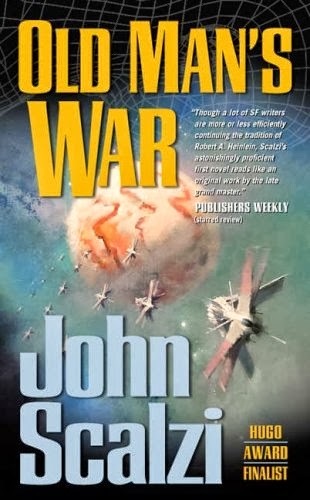 At least Old Man’s War doesn’t include the added irritation of several pages of gushing reviews and comments that, frankly, most readers don’t want to wade through even in print books. But, all in all, I give the sample a C- on formal considerations. The best I can say is that nothing was misspelled or misaligned. But I’m still bummed that of a 33 page sample, there are now only 25 pages left for me to taste Scalzi’s story. I’ll get to that next time. This post originally appeared on my science fiction blog, Sancta Futura.